This modern-looking church in Easley is new in building only. Established in 1798 by North Carolina missionary Reverend Elnathan Davis, the original structure was a meeting house built on Dody’s Creek, according to the 1814 records of Pendleton District. It was incorporated in 1872. The congregation grew over the next few decades, and in 1924, church members decided to build a larger brick building. The current church was dedicated the following year and underwent major renovations from 1968 until 1975. 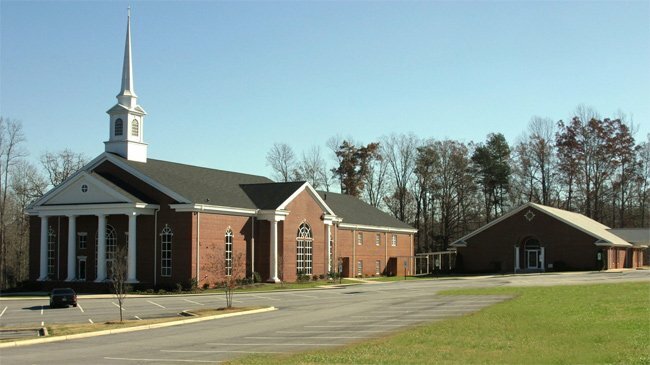 In 1999 a children’s building was added, and in 2003 a new sanctuary was built. While the church has had many updates over the years, its spirit is rooted in over two centuries of history. Thank you; we have changed it. According to the sign pictured in Find A Grave, Cross Roads is 2 words as it is in the address.